All parties need a special cake! Our first birthday girl picture cakes are all made freshly to order by our local specialist cake bakers. All parties need a special cake! Our first birthday girl picture cakes are all made freshly to order by our local specialist cake bakers. These cakes have pink and white icing for your daughter's special day. Just send us a favourite photo of the birthday girl and we will print it on edible icing on top of the cake. The girl's name can be iced at the bakery if required and we can even supply printed ribbon of your choice to wrap around the cake. The cakes are all freshly made to order using top quality ingredients and free range eggs. 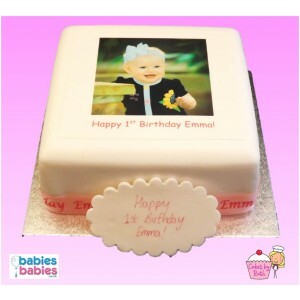 You can have the name of your baby added to the cake or even have a personal message added. There are 3 sizes of cake: 6" which provides 14 slices, 0.9kg 8" which provides 28 slices, 1.6kg 10" which provides 46 slices, 2.5kg (based on a 1" x 2" portion) You can choose from the following flavours of sponge: Vanilla Gluten Free Flower Baby Reveal (we can provide you with either a blue or a pink sponge if you wish to have a baby reveal cake) Please order all cakes at least seven days prior to you your party. 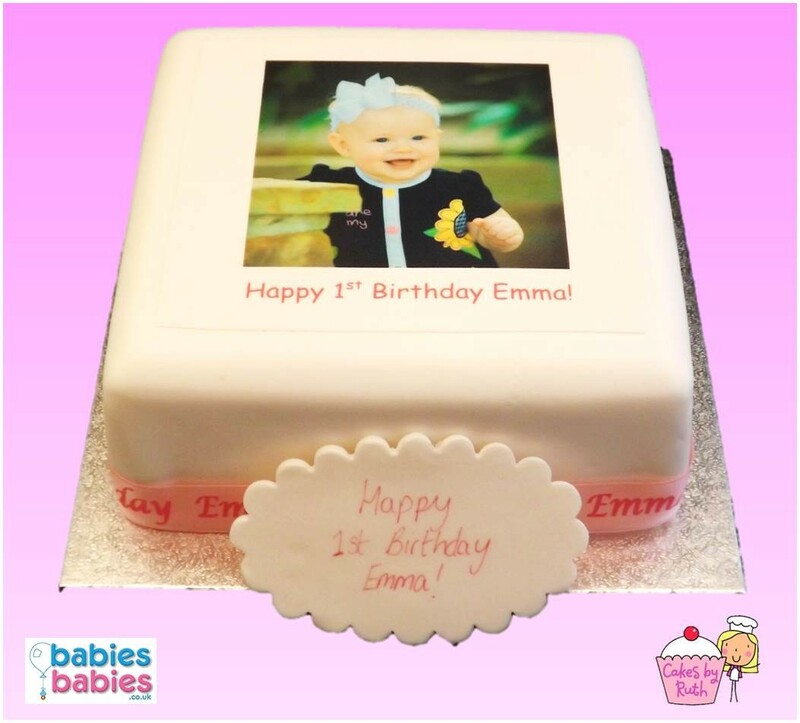 Personalised Message - if you want to add personalised message to your cake please put the name of the recipient in the text box above Ingredients: Vanilla Sponge - Eggs, self-raising flour, caster sugar, butter, baking powder, golden syrup. Gluten Free Sponge - Eggs, Doves Farm Wheat Free Self-raising flour, caster sugar, butter, gluten free baking powder, golden syrup. - Eggs, Self-raising flour, caster sugar, butter, baking powder, golden syrup, Sugar flair colour paste. Please make your selection above. Our cakes are packaged to ensure they will arrive with you in perfect condition; however there is always a very remote chance that it may get slightly damaged in transit. If this happens we supply all cakes with a basic repair kit that includes spare ears, nose and hair quiff plus a small pipette of edible cake glue. You can add the extra finishing touch to your cake by adding personalised cake ribbon round the cake. You can personalise your ribbon in the text box above.